What’s there to know about garage doors? Since 76% of homes have garages, there are a significant number of people who need to know what is important in garage doors. First, there are 5 basic types of doors – more than you probably thought existed! Retractable – These consist of one solid piece door with hinges allowing it to rise up (retract) into the ceiling space of the garage. These need a significant space in front of the door for clearance when opening and closing. Canopy – Similar to the retractable garage door, usually these are not automated. Sectional – Made up of separate horizontally hinged panels, these rise vertically, so do not require any clearance in front to open. Roller – These are more often found in commercial building; the door rolls up into a round shape above the top of the door, inside the garage. Side hinge – Just like it sounds, these doors have hinges on the sides, and open in the middle, much like a main entry with double doors. These also require quite a bit of clearance in front of the doors to allow for the outward swing of each door. See www.diygaragedoors.co.uk/doortypes.htm for diagrams of outside clearance required for door types. Garage doors come in a variety of materials, with varying possibilities for insulation and security. Steel doors are becoming very popular due to their strength, durability and endless design options. They must be insulated, as steel has no real insulation value, and most steel doors are insulated. The lower the gage of steel (better quality doors are 24 gage) the thicker the steel. Aluminum doors are much like steel, but lighter and less sturdy, so they are prone to damage. Wood doors would benefit from being insulated, and require regular maintenance, such as painting. Wood composite doors are made with recycled wood fibers; they have the look and texture of wood; they are stronger than wood and can be painted or stained, and resist rot and splitting. Fiberglass door panels are encased in aluminum frames, can be pained and offer greater resistance to dents than thin steel. Fiberglass is very light, is a poor insulator and can fade from exposure to sunlight. However, it is a good choice for coastal locations as it is resistant to salt water corrosion. See also www.cheshiregaragedoors.co.uk/garage-door-types.html for more information on insulation, automatic door openers and the advantages and disadvantages of each type of door. 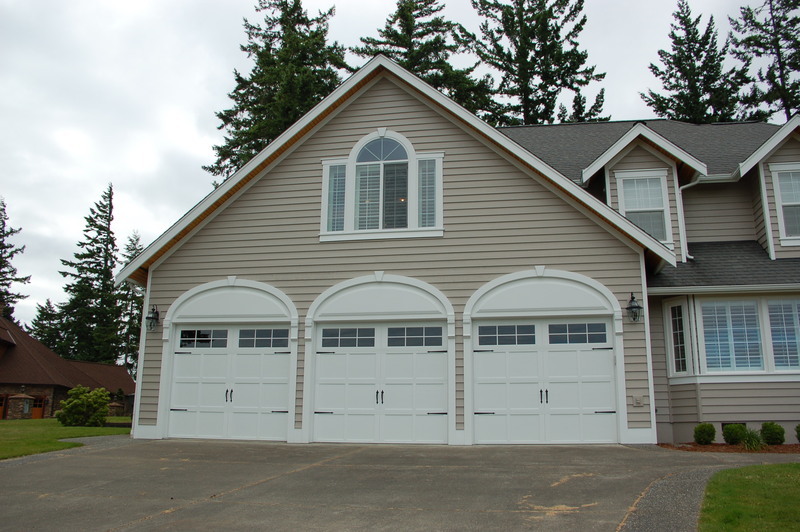 Be aware that the garage door is the single most visible aspect to the front of most homes. Replacing an aging garage door with a well-designed and insulated door can make a huge difference in the appearance, and hence, the value of the home.